Mr Davis dramatically resigned as Brexit Secretary in July in protest at the Prime Minister’s plan for leaving the EU. And today he said Mrs May needed to abandon the proposal, and replace it with a new roadmap, by Christmas at the latest. The ex-Cabinet minister said he believed the current plan would be rejected by both British MPs and European Union leaders. Britain is due to quit the European Union on March 29 next year. However, Mr Davis said any Brexit deal with Brussels would need to be approved several months in advance. He told BBC Sunday Politics Yorkshire: “I think in practical terms, there’s got to be a ratification process afterwards. “So if you work back from the end, it’s got to be done by the end of March 2019 in terms of the overall deal. “But before that, the European Parliament has got to ratify it, and the 27 EU member states other than us have got to ratify it. “The UK Parliament has also got to agree to it and pass legislation. That all takes time. 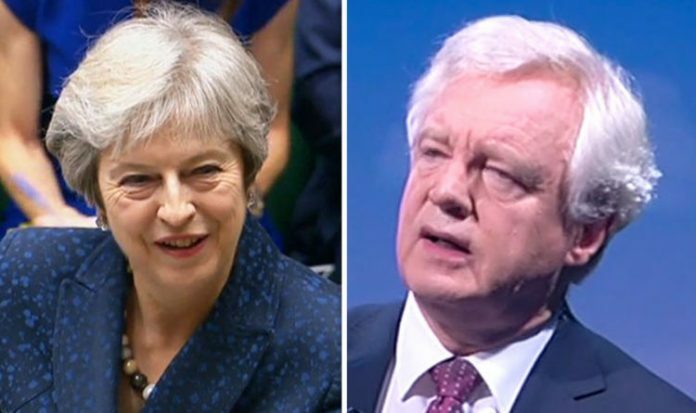 Asked what would happen if Theresa May sticks with the plan, Mr Davis said: “The EU will say either no to Chequers, which I think is the most likely outcome, or pile more on it and she won’t get it through Parliament. Mr Davis, the MP for Haltemprice and Howden, also played down reports Mrs May could be ousted as Tory leader. He said: “The vast majority of the party want her to carry on and want her to get the best deal possible. “I don’t know who will lead us into the next general election. That’s up to her, she’ll have to decide if she’ll do it or not. “If she chooses not to, then who knows who it’ll be? But it’s up to her. It’s her decision.